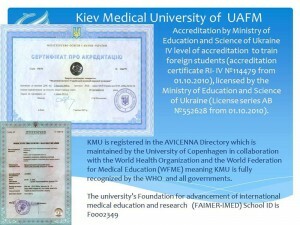 The Kyiv Medical University of UAFM is a first private university among the former Soviet Union countries, founded in 1992 on the basis of combination of classical and alternative medicine. 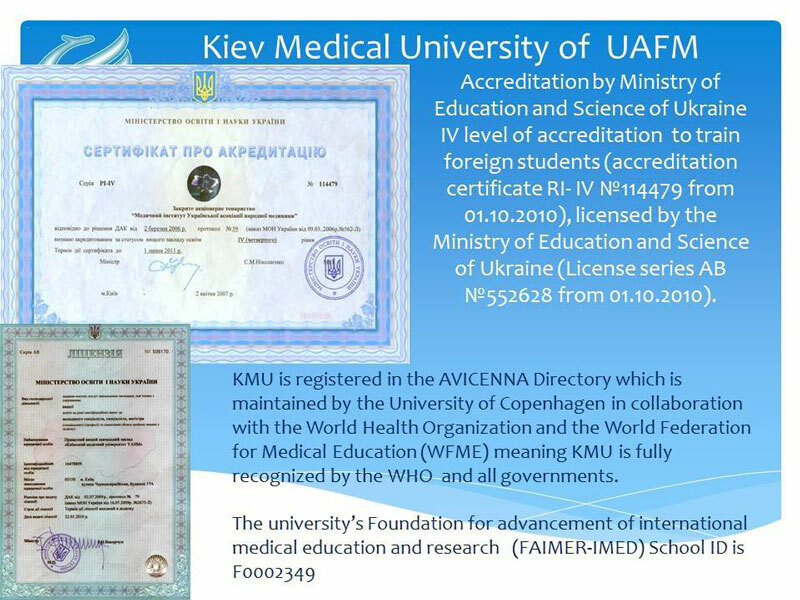 The Kyiv Medical University of UAFM is accredited by the Ministry of Education and Science of Ukraine (accreditation certificate is РІ-IV №1110158 — 09.09.2011) and licensed by the Ministry of Education and Science of Ukraine for the 4th accreditation level (license is AD № 072575 — 13.08.2012). — become a competent specialist at the national and international labor market upon graduation from the University. Competent teaching staff is concerned about providing high level of support. The total number of teachers amounts to 250 academicians. Most of them have scientific degrees together with the great experience of pedagogical work. Special attention is given to each and every student to make the graduates competitive professional doctors on the national and international labor markets. Moreover, student government initiatives allows students to enjoy an active student life. 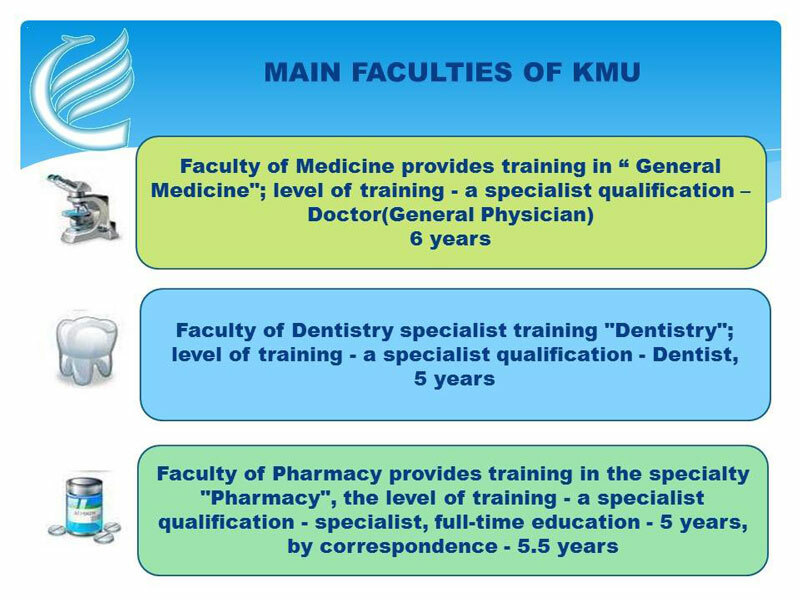 The main goal of the University teaching staff is to train highly qualified medical professionals. In such manner, the University is fully equipped with the great material base, modern medical facilities, computerized lecture halls, international scientific research data base. It is to be said that academicians and students regularly get internship in foreign educational institutions, participate in international and all-Ukrainian scientific conferences. Upon the studies at the University young professionals can use the knowledge and skills of both classical and traditional-complementary medicine in their daily practice. This note is closely linked with the main goal of the education at the University: to train medical students under capability to combine knowledge of the official and complementary treating methods while practicing. Pharmacognosy, Phytotherapy, Homeopathy, Manual Therapy, Reflex Therapy are some of the examples of elective courses in complementary medicine. After graduating from the university, prospective students receive state standard diploma of a higher medical education. Presently there are about 1.500 students at Kyiv Medical University from 17 countries of the world. The University provides all the necessary conditions for the comfort and fulfillment of studying process: effectively developing English-medium education. The curriculum and studying plans of the Kyiv Medical University are composed in accordance with the state standards of the higher medical education; the students have an exclusive opportunity to study medicine with excellence of teaching. 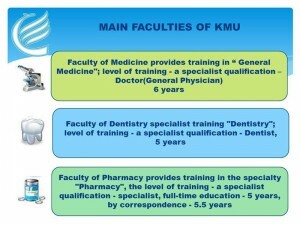 Theoretical departments are located in the separate branches of the University whereas Clinical departments are situated on the bases of profile research institutions and clinics of Kyiv city. The University has it’s own library. Moreover all students get access to the National Ukrainian Medical Library which is the biggest scientific library in Ukraine.